Last week, the Federal Reserve released their March FOMC meeting minutes. Following the release, the markets surged higher as the initial reading by the markets was“the Fed is done hiking rates.”As the Wall Street Journal reported inFed Minutes: Officials See Little Need to Change Rates This Year. “I’ve said many times to insert ‘S&P 500’ for ‘financial developments’ because that is essentially what we’re talking about here when its cited.So the Fed is referring to ‘significant uncertainties’ with regards to the S&P 500.What uncertainties exactly now since the S&P 500 is just off all time record highs? Furthermore, as I notedin this past weekend’s missive, the Fed has already been dropping hints(since the March meeting)about further rates hikes in 2019 and 2020. Most importantly, even if the Federal Reserve does begin to reverse course and inject liquidity, the effectiveness of those actionswill likely not have the same effect. 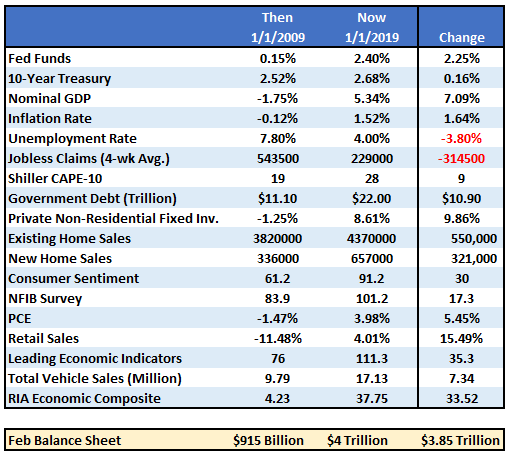 Because the economic backdrop is not what it was a decade ago.The table below compares a variety of financial and economic factors from January of 2009 to January 2019. Unfortunately, the Fed is trapped between the data and their“need to do something”to keep the asset prices inflated to support economic growth. 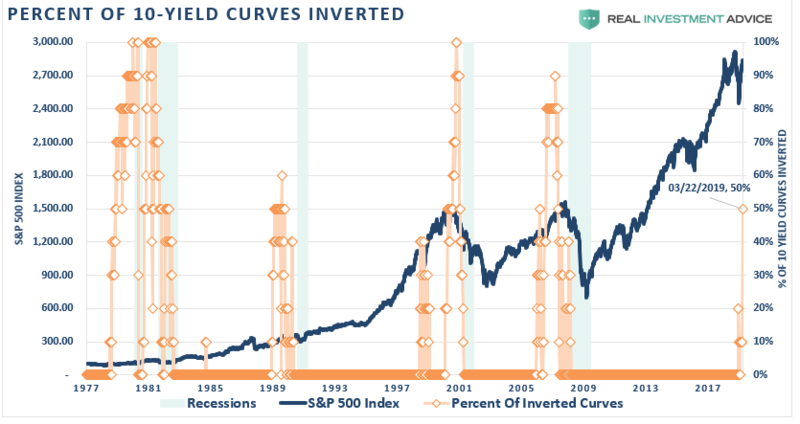 Currently, 5 out of 10 yield curves we track (50%) are now inverted.Such is the highest risk of a recessionary onset as we have seen since 2007. “Negative or near zero interest ratesrepresent conditions that understandably exist immediately following a deep recession, not 10-years after. Fewer Tools Left in the Policy Shedas the Fed ends the tightening cycle with the absolute and real Federal Funds rate several hundred basis points lower than any economic cycle in history. Debt Is a Governor to Growthand debt that is not self-funding is future consumption brought forward. 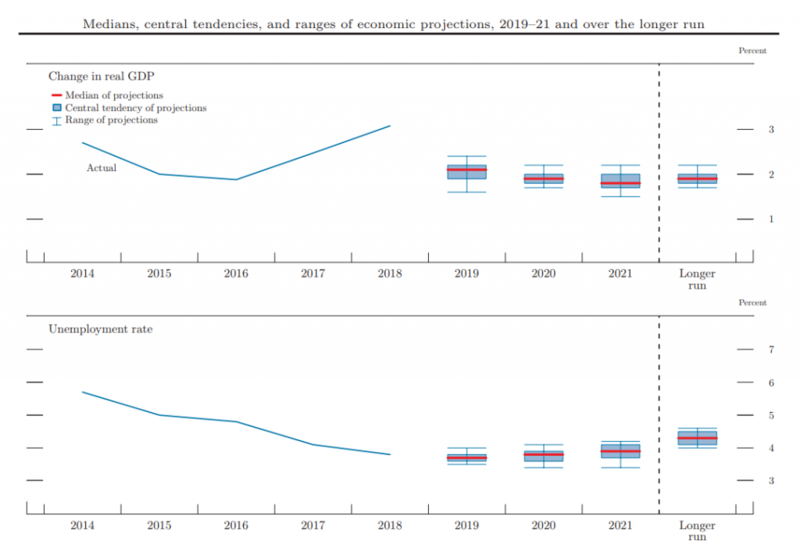 Deficit and Demographic Threatscombined with a Fed balance sheet, which is four times normal, and slowing population growth, diminish intermediate to longer-term economic and profit growth prospects. Such is not supportive of higher valuations or asset prices. No Country Is an Economic Islandand the lack of coordination between the super economic powers in the world will likely exacerbate worldwide economic risks. Low interest rates are (ultimately) deflationary,sustaining zombie-firms in a “liquidity-trap,” which weigh on overall economic performance while also weakening investment.